The Flyers’ long run of goalie issues have been at their worst this season. 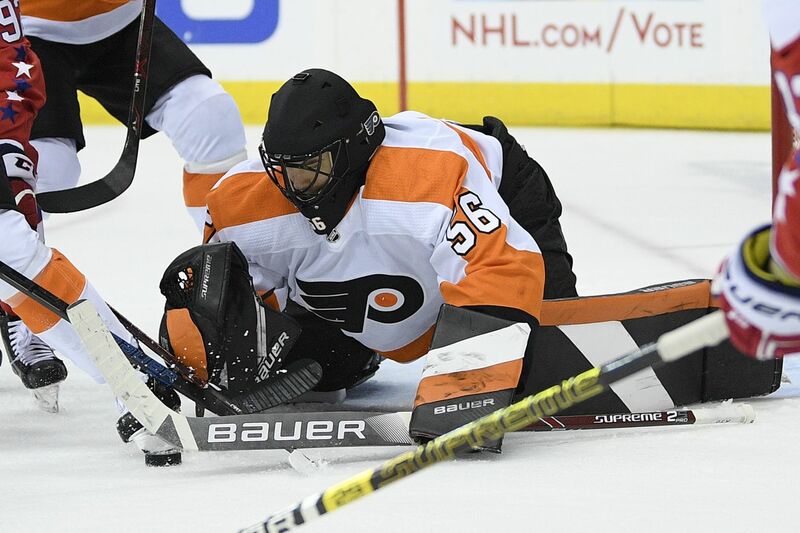 With Mike McKenna’s start in Washington on Tuesday, he became the seventh goaltender to play for the Flyers in the 2018-19 campaign, tying an NHL record reached by just three other teams (the 2007-08 Los Angeles Kings, the 2002-03 St. Louis Blues and the 1989-90 Quebec Nordiques). It’s not exactly a record you want attached to your club’s name, especially when the Flyers reached it just over halfway through the season. It isn’t one that bodes well for playoff hopes either, as the 2002-2003 Blues are the only ones to have made postseason despite their instability in goal. The Flyers' goaltending statistics following Tuesday's loss to Washington. The Flyers have allowed the third most goals in the NHL (155) following Tuesday’s loss. The Los Angeles Kings' goaltending statistics for the 2007-08 season. Jonathan Quick, at 21 years old, made his debut in an 8-2 win over Buffalo on Dec. 6, 2007. He stopped 15 of 17 shots, but would only appear in two more games for the 2007-08 campaign. He started in half the Kings' games the next season and emerged as their full-time starter going forward. Los Angeles gave up 263 goals, the third most in the NHL for the year. The St. Louis Blues' goaltending statistics for the 2002-03 season. The Quebec Nordiques' goaltending statistics for the 1989-90 season. Quebec allowed 407 goals that season, the most in the NHL. Flyers interim coach Scott Gordon played 10 of his 23 NHL games for the Nordiques that season. He has a career .830 save percentage and a 5.60 goals against average.